Since the adoption of European Convention on Human Rights in 1950 it became clear that the migration issue is religious-economic-political. Europe got wiser and today wants to withdraw from the global #migration pact. It is egoism explaining to us that it won’t allow us to live together! Everything that happens, even descents and exits from spirituality, come from the Creator. Once a person acquires the quality of bestowal, he will see that absolutely everything comes only from the Creator. It is therefore necessary to strengthen yourself in patience and lowliness. When one accepts this, spirituality is revealed to him. The end of the world isn’t at the year 6000. Spirituality has no time flowing freely as in our world as we think. 6,000 years is 6,000 steps of ascent over egoism to the property of connection/bestowal/love. Till we conquer them, our sensation will remain egoistic—feeling only this world. Question: Is the mass dissemination that you have launched based on the fact that we have reached the last generation? Answer: The words of my teachers that we are in the last generation are my starting point; I must act on this fact. Therefore, I act. What will come out of it is not my doing, but the Creator’s. I do not know how it will work out either, but it does not particularly interest me. I have to do what I can. 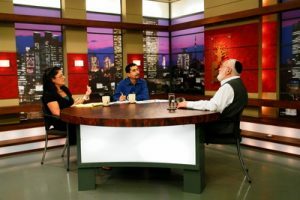 There are no secrets of the Torah, no secrets of the universe, no secret forces, spells, and other things. There is a system of uniting all people in the world into the same system of Adam, which we were once in. Therefore, I see nothing wrong with that. I have nothing to be ashamed of and nothing to fear. Remark: But there is only one secret we always come back to: We cannot unite by ourselves. We can only make efforts, and everything else is done by the Light that returns to the source. My Comment: This is already a method! But to call on all nations to realize the Creator’s plan is our duty. We have come to this state and cannot ignore it if we want to be somewhat connected with the Creator. Therefore, to establish this foundation is exactly what I wanted in my life. Life is a game. It is so everywhere and always. This is determined by nature at all levels. In order to grow, change, dialectically build himself, and consistently develop, a person must be in the game! Any blade of grass plays in order to grow. Look at puppies, kittens, anyone—everything is in a game. People are constantly playing, but do not feel it. A person goes to work, goes to the army, fights, and dies—it is all a game. If I imagine the past, the present, and the future and connect between them, it is a game. That is, the game is a representation of the future state and the motion toward its implementation. A person always plays in the future, no matter in which one. If he stops, it marks his death. That is how nature organizes it. Question: Does the Creator receive pleasure from the fact that a person accepts this game? Answer: By the fact that a person accepts this game, he himself obliges the Creator to play and becomes His partner. Therefore, he is called “Adam,” similar to the Creator, because he solves this whole game. Exactly in this is the choice of freewill and the choice of the path. Either a person does not want participate in this or, on the contrary, he participates in order to reach a higher goal. He understands that this game is required only in order to elevate him to the next degree. The game is a system of development of any part of nature at all levels. How can we encourage workers to unite as one body in order to achieve the goals of the organization? It can be achieved by building a supportive environment that will draw everyone into a warm and secure connection with one another. We begin by raising the importance of connection, praising bestowal, and setting an example in working for the sake of the society. As the desire develops in this new, positive direction, whatever we do in the organization will be a breakthrough and everyone else will follow the example. Management will provide ongoing workshops for staff to learn about human nature, the development of the ego, our mutual interdependence, and the current, global crisis. Gatherings will also include songs, sharing positive impressions from the connection, and a reminder that we have come to work to enjoy being together and not to suffer. The new spirit will open the hearts and minds of staff and laziness and indifference will vanish. As a new year approaches, an atmosphere of increased consumerism envelops societies across the globe. However, there is a generational stratum that is spoiling the commercial hoopla: the millennials. Getting a new car, a new house and a new partner are common New Year’s resolutions. None of these goals, however, impress the millennial generation born between 1981 and 1996. They have been the subject of intensive scrutiny by economists and analysts in efforts to interpret their financial priorities and mindset. Why is this so important to economists? It is because millennials, estimated at around 80 million people in the US alone, are projected to surpass baby boomers as America’s largest generation. The millennials were expected to consume more and contribute more to the economy than the baby boomers, but it’s not happening and analysts want to know why. Are the non-capitalistic choices of this group to blame for destroying the economy? Or are their modest spending patterns the product of a merciless economy inflicted on Americans for years under the control of the elites? 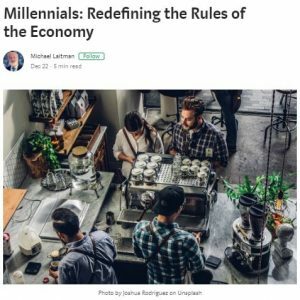 A new study by the Federal Reserve Board revealed that in comparison to previous generations, at the same age, millennials have lower income and less wealth than their predecessors. Being born and raised in an era when capitalism was out of control, in which the strong preyed upon the weak, they found themselves hopelessly in debt from financing their university education, making it practically impossible to afford independent living even at a minimum level, let alone buying a new house. However, experts and leaders point blaming fingers at them for their limited spending and its “negative effects” on the economy. Millennials were expected to consume and participate in the labor market at least as much as their parents, if not more. They were supposed to believe in the American dream, just like their parents. But they have lost hope and trust in the current economic system, while experiencing the highest levels of anxiety and depression on record. However, instead of addressing the root of the problem, the economic establishment and the media (which is at the service of the elites) are disgruntled that they cannot extort the children, the millennials, the way they managed to extort their parents. Tomorrow, the world will continue to try and follow the same outdated financial patterns. The elites will continue to maintain the traditional economy that encourages consumption and concentrates capital under the control of a handful of tycoons. Feeling deprived and frustrated, more and more people will demand social justice. They are likely to replace leaders, call for the limitation of salaries of elected officials, demand the lowering of VAT (value-added tax) on basic goods, and a freeze in tax increases for the lower and middle classes. The future is not far off when the world will look quite different: an industrial-technological revolution will make giant steps toward mass automation, throwing much of the workforce out of the labor market and locking the gates behind them. When there is no work, there are no salaries, and when there are no salaries there’s no money to spend, and when there is no money to spend, non-essential products aren’t purchased, and since a major amount of what we presently consume are non-essential products, then the domino effect continues as the businesses tied to these products also fall. Under circumstances like these, what will the unemployed masses do? Will this scenario open a valve of frustration and rage into the streets? Are the recent violent riots in France just a small taste of what’s in store? While this may not happen tomorrow, what will day after tomorrow bring? It is both possible and necessary to prepare ourselves now for the coming future. Accordingly, we must plan to prevent undesirable future chaos by ensuring that every citizen receives a basic income sufficient to live in dignity. However, alongside fulfilling physical needs, we must also calm the spirit and fulfill the soul. In the face of these huge systematic changes in society, a newly-tailored educational system is crucial to help disoriented citizens reorganize their values and priorities. The goal of such education is to guide people to positive and balanced relationships through a clear understanding of the global integral system in which we live. The expectation that money can provide a sense of security will disappear as the crisis worsens. Therefore, we must educate ourselves in how to build a society that provides a person with the kind of security found in a loving family. Instead of nurturing predatory competition that puts us in a constant race of survival, we will develop humane competition that drives us all to contribute as much as we can to social cohesion. Instead of engaging in jobs that exact a heavy psychological price to the benefit of corporation owners, we will turn to creative and social occupations that serve the majority in a new whole new concept of work. Instead of judging people by how much they earn, we will measure each other according to our contributions to society. Instead of working around the clock and barely spending time with our children, our time will be spent building tight family units. Instead of an advertising industry that drives us to compulsive consumption of pointless products, we will learn to live happily and sustainably. Instead of marketing propaganda that sells well-packaged material illusions, the media will help us see that happiness lies in positive social relations. Of course, none of this will happen tomorrow morning, but today we can begin this gradual and ongoing educational process. Unlike anything we have known before, such a transformation of society cannot come through coercion and oppression. Instead, it is a process of building new values in society and upgrading public awareness so that we start balancing ourselves with the constantly fluctuating, globally interdependent conditions. As a result of this upgrade in collective consciousness, institutional changes in the concept of labor and in the economic system can develop organically and peacefully. Moreover, when we begin to focus on building qualitative, meaningful relationships, we will discover a newfound source of satisfaction. As the emphasis shifts to how we can positively connect above all differences in society, we will become less immersed in material matters, and more involved in a fulfillment that is a lot more natural and common to all people. We will then feel a new kind of happiness, confidence and satisfaction as we, through our efforts to positively connect, begin to tap into an energy source dwelling in nature that will nourish and advance us to a higher level of consciousness.